The single biggest reason your property taxes go up is because of voters and politicians raising rates — not because home values have skyrocketed in recent years. Each story about the recent trend of falling home prices brings emails from readers with the same question: What does this mean for my property taxes? It’s understandable — the median property tax bill for a homeowner in King County has soared 43 percent in the last four years, reaching nearly $6,000 last year. Any chance at relief would be a welcome sight for property owners, and for renters who have been dealing with landlords passing the higher costs onto them. The short answer is that the recent downturn in the market won’t have any effect on your 2019 property-tax bill. The long answer leads down a winding rabbit hole that’s a lot more complicated than you might imagine. The King County Assessor’s Office, which handles property-tax bills here, says some local officials and legislators in Olympia don’t understand how property taxes here work, and that even some employees in the assessor’s office are left scratching their heads at times. Here’s a basic guide on property taxes, with the help of interviews with five — yes, five — managers at the assessor’s office. You (or your mortgage company) will get the first half of your 2019 bill after it’s sent out on Valentine’s Day — and there should be at least one sweet treat inside. About two-thirds of the property-tax bump last year — which was the largest in modern history — was the result of the state Legislature raising taxes to fund education, in response to the McCleary court decision. Those taxes will continue, but there was an especially big bump last year for most school districts that will be reduced this year, so that part of your bill will likely go down by about 25 cents for every $1,000 in assessed value. That translates to a reduction of about $125 from last year for the median house countywide. But that’s only one piece of the puzzle. Are this year’s overall rates going up? Are they going down? Officials in the assessor’s office said they were still making many calculations and did not yet know how this year’s bills will compare to previous years. The first thing to know is that county assessors, by law, peg your tax bill to your home’s value set a whole year ago, since they need the full year to go around figuring out the values of all 715,000 parcels in the county. That means the bill you’ll get next month will reflect the assessed value of your house as of Jan. 1, 2018. 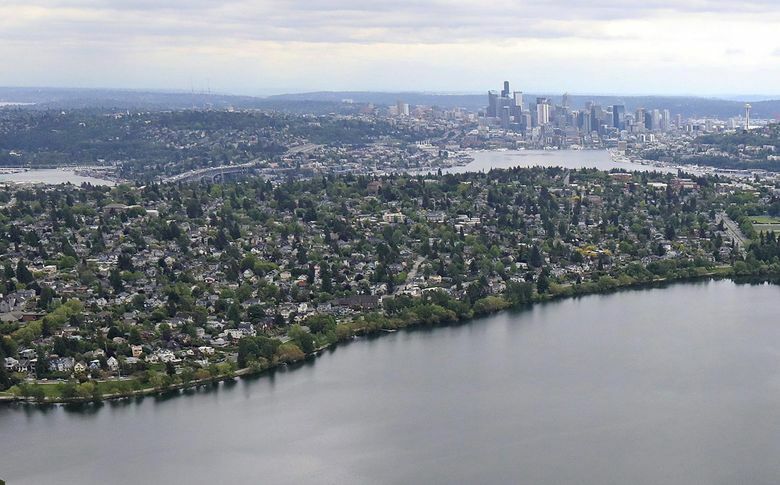 At that point, the Seattle area still had the nation’s hottest housing market, with prices soaring 20 percent year-over-year. The downturn didn’t start until the spring; since then, prices have dropped 12 percent countywide. So will the softening market help with your 2020 taxes, at least? Not necessarily. It seems like a logical connection — home prices go up, property taxes do, too. And that’s been the case for a while. But believe it or not, that’s mostly a coincidence. The assessor’s office says changing home values “are the least impactful” ingredient in the changes to the stew they use to set your bill. This is especially confusing because your tax bill looks like it’s generated by multiplying your home value by the tax rate, and lately home values have been soaring while the tax rates have actually gone down slightly in recent years. That’s not really what’s going on, however. So how are taxes set? Basically, the assessor calculates how much money each public agency that gets property-tax revenue is due — from cities to schools to fire districts. Then the county works backward to charge property owners a certain amount, based on their property’s value, to generate the total taxes each property owner pays. Those districts, by law, aren’t allowed to raise the revenue they generate by more than 1 percent each year (although there is a very big loophole — more on that in a minute). Here is a very oversimplified example: Let’s say a school district is due $100 in property-tax revenue this year. There are two properties in the district — a red house worth $250,000 and a blue house worth $750,000. The owner of the red house, which has one-fourth the district’s total value, pays $25, and the blue house pays $75. The next year, the district would be allowed to charge 1 percent more — in this case, another dollar. If the houses are still worth the same amount, the distribution stays the same: the cheaper red house would then have to pay an extra 25 cents and the blue house another 75 cents. Even if both homes double in value, they’d still have the same bill — just with a higher assessed value and an artificially reduced tax rate. However, there is a scenario where your home’s rising and falling value could come into play: If your home’s value rises faster than your neighbor’s. If that cheaper red house catches up and becomes worth the same amount as the blue house, then the $100 bill would get split evenly. In other words, one homeowner would see a property-tax increase, and the other sees a decrease. This often doesn’t have any practical effect, since home values generally rise fairly uniformly here, though renovations and additions can bolster a home’s value relative to the rest of the neighborhood. Also, the county’s appriasers come out and visit each home once every six years to “reset” the home’s value — so you may notice an especially large bump (or decrease) once every six years. (The other years, the assessor relies mostly on nearby sales and market values to determine your assessed value). You may have noticed the actual taxes you pay have gone up far more than the 1 percent cap allowed. That’s because voters and public officials can override that cap with special taxes. And, boy, have they done so. Before the Legislature’s aforementioned education-funding plan boosted rates a year ago, the voter-approved Sound Transit expansion was a big reason taxes went up in 2017. Special levies for schools — like one Seattle voters approved in November — will affect this year’s bills in certain areas. The relationship, or lack thereof, between home prices and property taxes is more obvious if you go back to the recession. From 2008 to 2012, home prices in King County plummeted 28 percent; and yet, the average property tax paid by homeowners in that span grew about 9 percent. This is America, and it’s your right to appeal your property-tax assessment. Only about 5,000 people a year do that, and they win about one-third of the time, typically by using comparable sales or updated conditions of their property to argue it’s worth less than the assessor says. More significantly, seniors 61 or over (as of Dec. 31 of the previous year) who own a home and make under $40,000 may qualify for an exemption or deferral, as do some disabled homeowners. The assessor has a special line for more info on that and to apply: 206-296-3920. And do take advantage if you can; there are 26,000 seniors and disabled people out there who may qualify but haven’t signed up for the program.